The art show is 4-7 p.m. Wednesday in the Silver Lining Performing Arts Center atrium. Art and written work from local students will be on display. Students of West Bend High Schools will be able to tour the gallery during the day with their classes. The show this year has expanded its activities, but narrowed its theme. West art teacher Deborah Prahl was inspired by the Degenerate Art exhibit held by the Nazis in Munich, 1937. Scott Lone, an East social studies teacher, has also been intrigued by the history of Nazi Germany’s treatment of art and the Degenerate Art exhibit. Thus the Forbidden Art theme was created. Another facet of the theme was the educational value it brought to the art show. “I felt it was a really interesting history lesson for my art students and we were able to tie it in with the social studies and English curriculums and what they were doing as well,” Prahl said. The students have been heavily involved in the show, such as contributing written pieces, which is a new addition this year. Students in English III and U.S. History were all given pictures of Jewish life before, during and after the Holocaust. 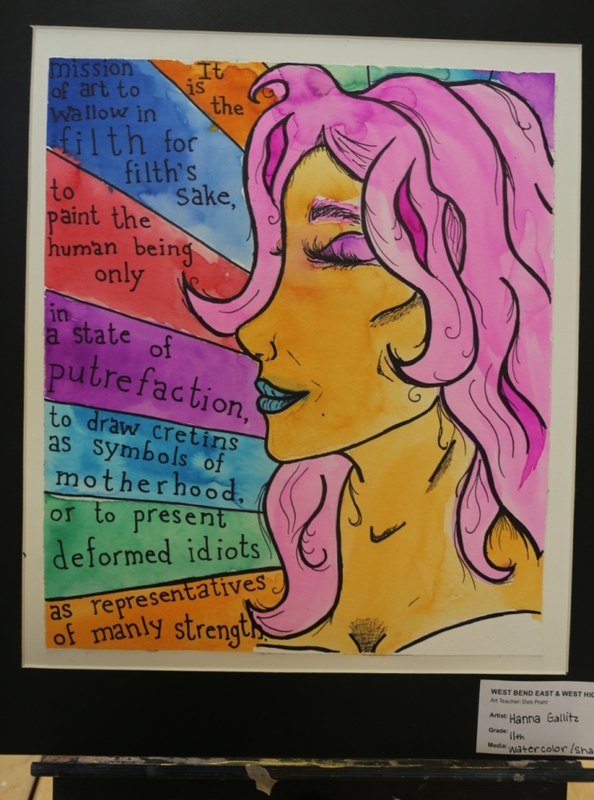 In addition to the writings, student art will also be on display. Jackie Luckow, an East junior, has entered a three-part oil painting with a butterfly theme relating to the Holocaust. Student art is not the only art that will be at the gallery. As a new feature this year, there will also be a silent auction where ceramic work by East art teacher Jay Krueger will be up for bidding. The auction will also offer some student artwork and a gift certificate for a family or senior portrait session. All the proceeds will go to a social service agency that helps Holocaust survivors who have fallen on hard times. Yet another new addition this year are the hot hors d’oeuvres and desserts provided by the culinary students of Sally Heuer, West family and consumer science teacher. A special guest will also be attending the show. Nate Taffel, the author of “Stolen Childhood: Coming of Age While Surviving the Holocaust,” will be autographing his book at the reception. Lone hopes the show will raise awareness of the Holocaust.